TechEd Day 2 started with a opening address/keynote by Anne Kirah, a Microsot anthropologist. The keynote was sort of a let down in terms of technology geekiness, there was no live demonstration or video of Windows Vista or Office 2007. But on the other hand, there was a good insight about how Microsoft cares about it customers, although she only focused on a small fraction of those customers. She explained a story about how Microsoft invited a range of beta testers for Windows XP, including two elderlies above 75. She higlighted the misconceptions of a “user” and “information worker” as commonly labelled by developers, the real users are the people who may not be IT pros. The general consesus of the beta testers are IT pros, who may encounter bugs and difficulties and view them as hurdles instead of submitting bugs. So it was important to Microsoft to invite people who you would normally exclude from a beta. And that’s also why Microsoft needs anthropologists too. I attended a session on Windows Vista performance enhancements. Saw a demo of SuperFetch, ReadyBoost and prioritised I/O. 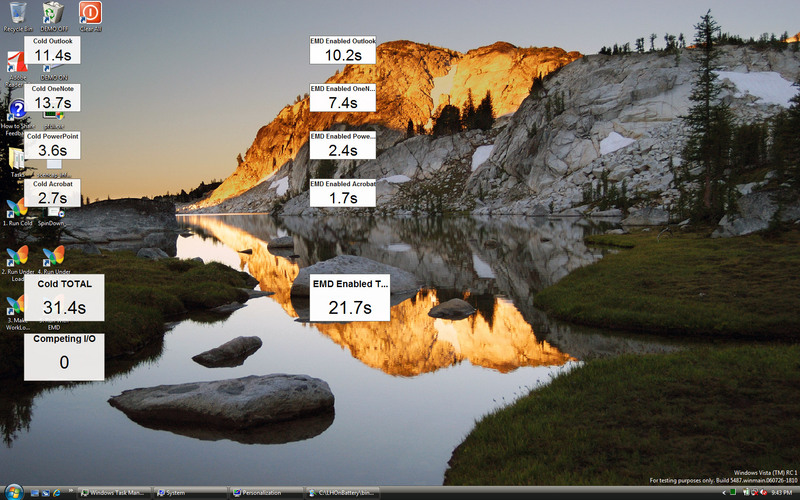 There were live benchmarks on Windows Vista using a script, you could see the obvious time diffrence when you plug in the flash drive for ReadyBoost. With prioritized I/Os, you can actually run the search indexer and fragmenter while you’re working. Not only will it run in low CPU priority, it will also have low I/O priority to make sure it doesn’t affect your disk write/read performance. SuperFetch is interesting because he explained how it worked. Not only is it an improved caching system, but it will also monitor your software usage (user, hour, day) to track patterns in your usage. Then it will proactively cache popular programs at bootup or resume from standby/hibernation. But this will all be running in low priority I/O to have no effects on performance if you need it. Also, got a good screenshot of the RC1 build (5487.winmain.060726-1810) he was using. Also, new Office 2007 splash screen?